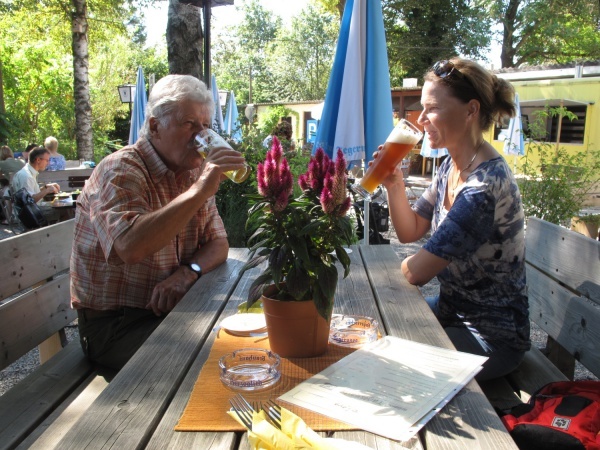 The very small Brückerl beer garden is located by the stream Langwieder Bach within walking distance of Langwieder See. There are only about 10 benches in the self-serviced area and about 150 seats in the serviced area. The building is about 100 years old. Over the last 60 years several innkeepers managed a restaurant on the ground floor. The beer garden exists since about 15 years. After some renovation, the restaurant and beer garden reopened under new management in 2012 and has kept the same concept as before: Combining stage, bar and beer garden. During the summer live music events take place outside. On sunny days Brückerl offers fresh Steckerlfisch (grilled fish on a stick) and delicacies from the barbecue to the guests in the beer garden. The restaurant combines a traditional Bavarian kitchen with regional produce. The Sunday specialty is Krustenbraten (pork roast with crackling) for only €7.90. The Tegernseer Hell (lager) costs €5.80 p/Maß. The restaurant can be rented for private functions and special events. The beer garden is open during the summer and when the weather is good from Tuesday until Sunday from midday until 1am.